Facilitating 10 emerging young global leaders to develop prototype apps for social good can be equally inspiring and intimidating. The small group of talented and passionate individuals generated nuclear levels of energy—channeling compassion, logic, and perhaps most importantly, hope to address the issue of violence against women. 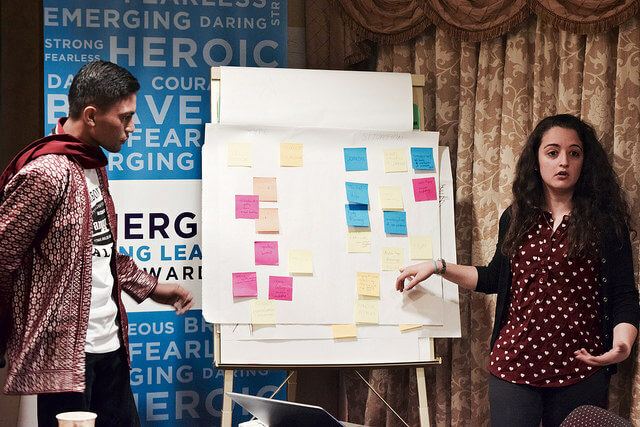 The Emerging Young Leaders Award program honors ten outstanding young leaders (ages 16-24) from across the globe. 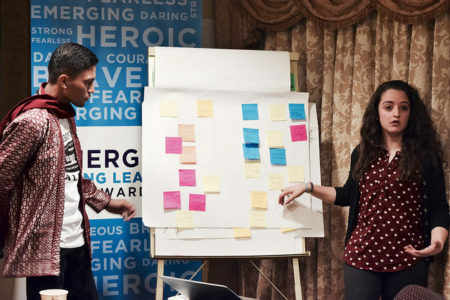 The awardees visit the United States for an intensive three-week program designed to recognize and support their efforts to enact positive societal transformation. As part of the their program the group received a day long workshop from Caravan Studios, a division of Tech Soup that build apps to help communities organize, access, and apply local resources to their most pressing problems. The cohort started the day identifying and demonstrating favorite apps –from the ubiquitous Instagram and WhatsApp to the more uncommon Houzz, a home design app, and Pocket, a save it for later app that lets you save video, articles, and more for access offline. Fast fingers flew to smart phones to download the apps as the team touted benefits and features. 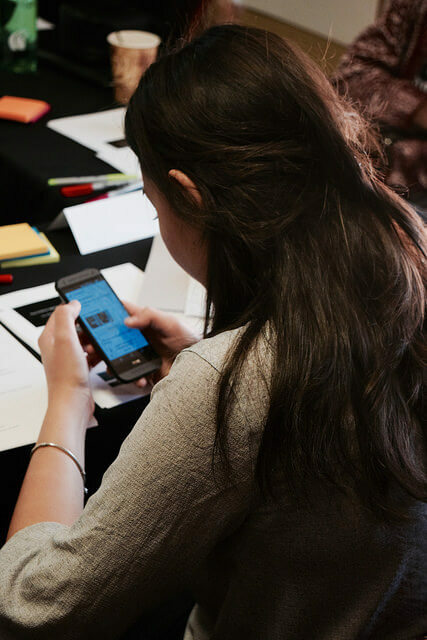 The activity initiated conversation and activities resulting in six prototype apps that would address different problems associated with violence against women. Small group activities were punctuated with team presentations and facilitated discussion of app generation and design concepts. Throughout the day, the women and men debated problems and constraints surrounding violence against women throughout the world. Using these concepts, they moved to vote on ideas that could best be addressed with technology. Asha and Nino, from Kenya and Georgia, developed an app prototype called B-check—or Belief Check–designed to help users to dispel religious myths that encourage discrimination and violence against women. The app engages the user to submit religious statements attributed to holy texts. The user toggles a radio button to identify the religion associated with the statement and the app would look up the actual text in that faith. The app would also have a quiz function that would use submissions to illuminate how misinterpreted religious texts were used. The team believes that encouraging discussion and examination of religious writings will help diminish abuse against women. Shunlei, from Burma/Myanmar, developed a Harassment Complaints app for survivors and interested community members to report abuse incidents and allow users to look up local laws that are supposed to protect women. The app would collect reports—users can choose to be anonymous or provide contact information—that would be used to show legislators the volume of incidents involving violence against women. Ahlem, a Tunisian woman, proposed Whistle, and app that would both protect women during a violent event and connect survivors with support systems, access to professionals and other survivors. She proposed a high pitched whistle which could be turned on and used to alert surrounding community members and connected to a circle of trust in the smart phone. Women would set up a profile with phone numbers, emails of family or trusted friends that would receive a notification if the whistle was activated. Shatter, an app prototype developed by Hillary from Malta, works to encourage and empower women to become more active members in businesses, events and government. Having women in decision making positions would help begin to address the issues of harassment and violence. The app functions to report events and organizations that reflect less than 50 percent women. App users can download petitions and letters to send to these event coordinators and organizations. Rather than relying solely on shaming these organizations, the app encourages users to submit names and contacts of women qualified to fill these positions. Hillary believes solving the larger issue of violence against women is a combination of illuminating lack of female leadership and providing appropriate resources to mitigate the absence of women in these positions. Synergy4Change, an app protype developed by Zulfirman from Indonesia, would address the needs of youth to equalize access to resources for girls and boys. The app would match businesses with resources and youth groups that need resources. Each would have access to complete a profile which would identify quantity and location of resources. Zulfirman believes that connecting individuals as humans through youth based activities helps people view and treat women as equal members of society. He has hopes to also use a map to highlight successful resource relationships. Gab, developed by a trio of young men, would provide a resource for female survivors of violence. The app features a reporting function and resources guide. Gab would allow survivors to report events, notify family and friends, and begin recovery. App users would complete a profile, including family and friend contacts. One of the defining features would be the ability for victims to tap smart phone in a particular manner three times—tap, tap, tap—which would trigger a notification alert to authorities and people in the circle of trust. After notification, survivors would be matched with local formal and informal resources to help them begin the recovery process.